The largest district of India, Kutch spans across an area of more than 46,000 km. Kutch is the word used for something that exhibits the property of quickly becoming wet and dry. A major part of the district, the Rann of Kutch is nothing but a shallow wetland which remains submerged during rains and stays dry all summer. The Rann is known for its salty mash flats that look like snow when dry. Kutch exhibits a very special tradition, history and ecology which to this day remains preserved. Kutch is the native place of many tribes. The area has a pristine ecology which has developed since the Indus Valley Civilisation depicting the perfect harmony that man and nature exhibit. Winters are the best time to visit Kutch. October to February witnesses relief from the heat and the place becomes lively. The Rann Festival is also organised during this time and it attracts visitors from all over the globe. Kutch district is surrounded by the Gulf of Kutch and the Arabian Sea on two sides. It can be travelled by road easily from Ahmedabad. The distance between Ahmedabad to Kutch is about 400 km. There are two broad routes that can be accessed while travelling to Kutch. Route 2 is about 80 km longer than route 1 and therefore, should be avoided. Route 1 explores many places of the Kutch district, which begins just a few kilometres ahead of Viramgam and therefore, it is the recommended route. Dhrangadhra lies 122 km from Ahmedabad. The town belongs to the ancient Harappan period. In the medieval times, the place was ruled by the lesser-known Jhala Rajput and it was their capital. The place has a vibrant culture and alluring history. Numerous temples like the Rokadiya Hanuman and Radhakrishna Temple witness a flock of devotees round the year. The place is silent near the Falku Dam where one can find a place to rest and walk through the strong foundations of the dam. The place marks the end of the Surendranagar district and a few kilometres ahead lies the entrance to the Kutch district. Despite being destroyed to the maximum extent by two earthquakes, Bachau has been able to preserve its place in the history of Gujarat. The place is 115 km from Dhrangadhra. Sambhavnath Jain Temple is located along the way and is a must-visit for spiritual realisation. The Kutch Desert Wildlife Sanctuary is located a little ahead from the place on the route itself. The wildlife safari through the sanctuary is a major attraction and self-driven vehicles can easily get access through the place. The sanctuary is a home to native animals like sambhar and chinkara. Bhuj is 80 km from Bachau and the city is known for its widespread destruction during an earthquake. The Prag Mahal of Bhuj is widely known for its Italian Gothic architecture and houses a clock tower and a museum in it. The Swaminarayan Temple is a place of peace and devotion. It is a perfect place to park vehicles and take a stroll around the city. The Kutch Museum, founded in 1877, houses rare artefacts and historical belongings of the ancient and modern periods, which are preserved to this day. The Aina Mahal, located near the Prag Mahal, is an 18th-century palace displaying vivid architecture, museum belongings and armour tools of the medieval times. Kutch is dated back to the prehistoric period when Dholavira settlement marked the rise of a civilisation. The ruins of Dholavira attest this fact. Numerous excavations have been carried out here and thus, it has become an archaeologically important place. Kutch even finds its place in Greek inscriptions as the place Menander once ruled. Later on, nearly every great kingdom of India ruled over Kutch, ranging from the Mauryas to the Mughals. Kutch carries as a distinct identity for its extensive tribal culture. There are many tribes which have their own distinct identity, culture and way of living and those can be explored while travelling. Kalo Dungar or Black Hill is the highest point of Kutch with a height of 458 metres. Kutch is also home to more than 20 major and numerous smaller dams that show the ardent efforts of water conservation in the desert state. The massive stretches of salt pans gives the barren land a distinct white look that stretches across hundreds of kilometres. It is an open space with a few local shops at distant sites selling local items in makeshift tents. The night time gives a clear moonlight over the entire place and illuminates it. Walking around the desert and arranging a bonfire along with family and friends make for a memorable experience. Roha Fort is one of the many forts located in Kutch. The place boasts of open skies and perfect sunsets. The ruins of the fort are perfect to visit for memories of the past, and photography during sunsets is recommended. The hill is also known as Black Hill and is the highest point of Kutch. 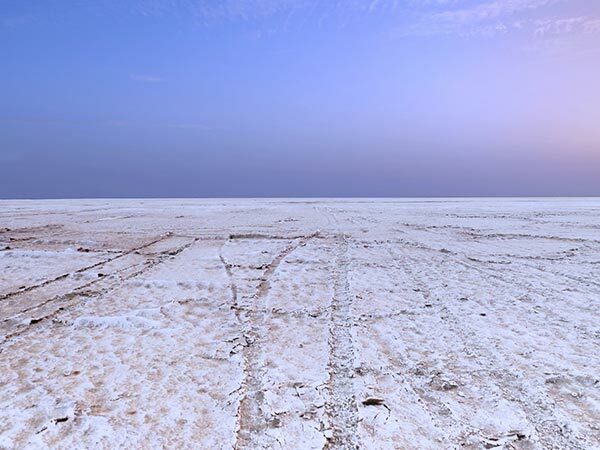 It is the only place which gives visitors, a panoramic view of the entire Rann of Kutch. It even has a sunset point and the Dattatreya Temple is located nearby. The lake spans across a large area along with the White Desert. Water sports are available during the rainy season. During dry seasons, a part of the lake evaporates leaving small enclosed waterbodies near the shore. The area is famous for Chir Batti. which are ghost lights reported to have been seen by locals and travellers.